October 07, 1987, LG Crabo. 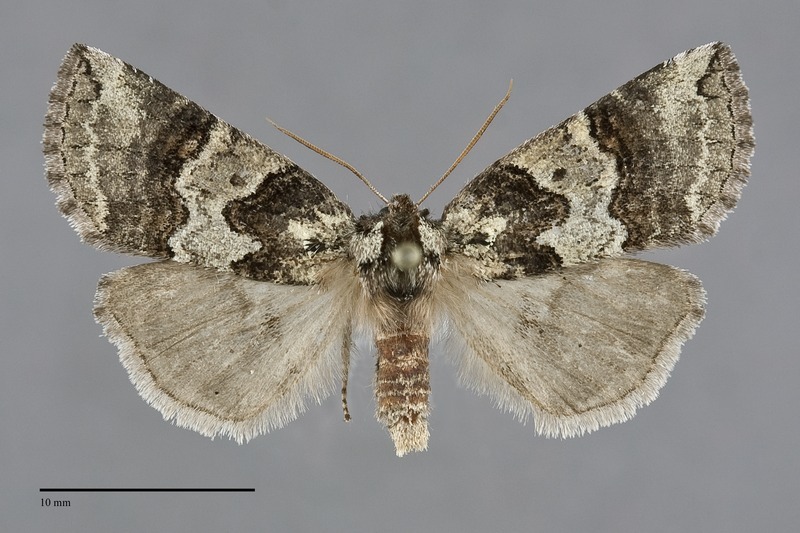 Ceranemota improvisa is a medium-sized Ceranemota (FW length 16 mm (n=2)) with banded greenish gray and dark brown-gray forewings that flies west of the Cascade Range during late fall. 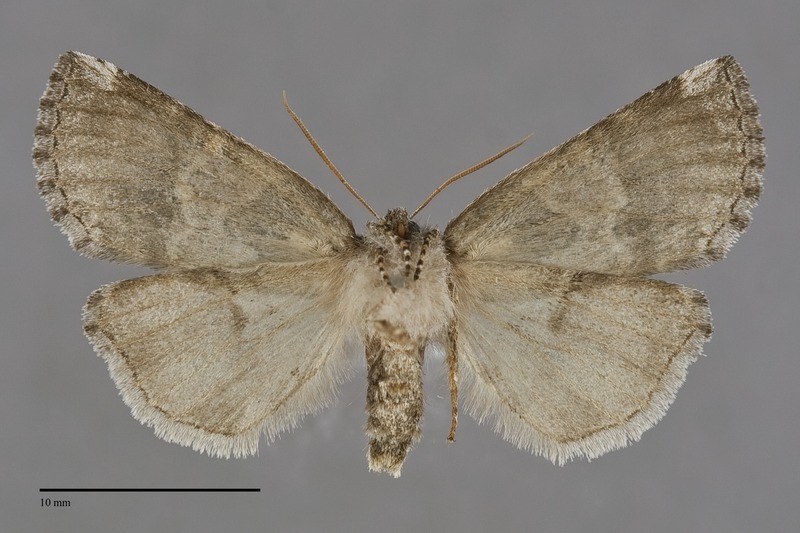 As in other species of this genus the wing has a slightly pointed apex and convex weakly scalloped outer margin. The ground color is medium gray with a slight green sheen, lightest throughout the median area and near the apex. The entire antemedial area and a band across the wing at the postmedial line are contrasting dark brown and charcoal, often with a brassy sheen. A short but thick basal dash is present. The antemedial and postmedial lines are compound, blackish gray surrounded by dark brown. The antemedial line is deeply undulating, drawn strongly toward the base in the fold, and the postmedial line is sinuous. The subterminal line is light gray, wavy, except black and sharply-defined near the apex. The terminal line is black. The fringe is gray with weak dark checkering. The orbicular spot is a black dot while the other spots are absent. The hindwing is medium brown gray with a faint gray discal spot and teraminal line. The hindwing fringe is lighter gray, sometimes with darker gray near the anterior margin. The collar is dark brown and the tegulae are gray with black anterior and medial margins. The male antenna is biserrate. 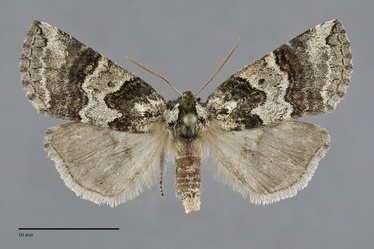 Ceranemota improvisa can be identified as a member of the genus by its late fall flight period, shiny gray and brown color, waved antemedial and postmedial lines, and reduced spots. It is distinguished from Ceranemota fasciata and Ceranemota tearlei by its dark antemedial and postmedial markings and by its deeply undulating antemedial line, both lacking or much less prominent in the other species. This species is common in mixed hardwood forests, coastal rainforests, and mixed hardwood-conifer forests at low to middle elevations in the Coast Range and along the west slope of the Cascades. Ceranemota improvisa is found in forests of western Oregon, western Washington, and southwestern British Columbia. Isolated records exist for further east. These should be scrutinized to determine whether they could be misidentified. This species is found in northern California to the south of our region. Most records are from the northern Sierra Nevada. This species feeds on various hardwoods such as hawthorn (Crataegus douglasii) and various cherries (Prunus spp.) in the Rosaceae. This species is single brooded and the adults fly in late fall from late September through November, with most records from October. It is nocturnal and comes to light and sugar bait.